I have been toying with the idea of a solar oven for quite some time now because, who knows? We may not always have electricity and cooking meals every day is important. I decided to "bite the bullet" and purchase an All American Sun Oven. I figured it would more than pay for itself because the fuel (sunlight) is free and it would come in awfully handy if/when there is no electricity. Not to mention, it's a great oven to take camping. Is There a Best Solar Oven? 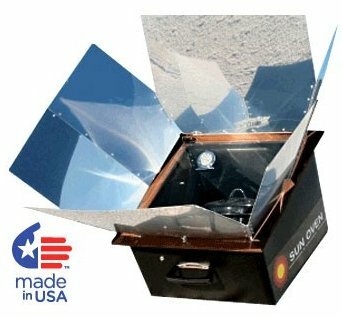 There are solar ovens that would delight an engineer with plenty of gadgets, right down to simple ovens made of cardboard and tinfoil. They all work — as long as there is sunshine, but because they are all constructed different the time to cook and the maximum temperature would vary. So it just depends on your specific need or desire. I have to tell you that I have only tried the Sun Oven so a different brand may work differently. I don't think you can go wrong with any of them. After all, the free fuel is the sun — the solar oven is just the tool. 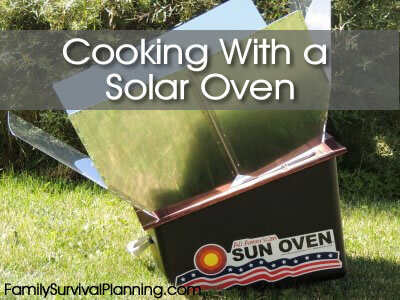 How Do Solar Ovens Work? A solar oven needs an outdoor spot that is sunny for several hours. They don't work at night or on cloudy days. So if you live in the northern hemisphere, chances are you can only use the oven in the summer months. The best sun is between 10 a.m. and 2 p.m. but cooking can take place all day as long as you re-orient the oven as the sun moves. Food cooks best in a dark pan because it absorbs the heat from the sun. Then a transparent plastic bag or a glass lid traps the heat inside the oven or cooking pot. The inside of the oven should have a shiny reflector which captures extra sunlight and cooks the food in the black pot. So all these parts, the black pot, the glass or plastic cover, and the reflecting material, work together to produce a hot enough oven to cook just about anything, including pasteurizing water. The more expensive ovens produce a higher temperature than the less expensive, cardboard types. Bake: Bread, casseroles, pies, cookies, brownies, a turkey and more. Dehydrate: Yes, you can use it as a dehydrator for fruit, vegetables, fruit leather and more. Boil: Boil water to purify it or to make a cup of tea or coffee, or hot water to use in your freeze dried foods. However, it is not like a stove top so it won't sautè, fry or deep fry. Bread will not brown as much as in a regular oven, but its still nicely browned. It's large enough to put several dishes inside, depending on their size. I purchased the combination package, which comes with three dehydrating racks, two stackable pots, one with a glass lid and one with an enamel lid. 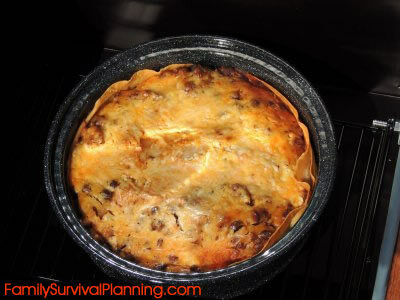 All Sun Ovens come with a built-in thermometer, one-piece collapsible reflectors, a spill proof leveling rack, as well as a CD ROM (for your computer) that has over 80 recipes, along with cooking tips, and a frequently asked questions (FAQs) section. It's durable, made in America, and with no moving parts to break. I seriously think it will last last longer than my lifetime. Does it get any better than that? The first time you use the oven and, obviously, after taking off the protective film that comes on the reflectors, set the oven out on a sunny day facing the sun with the reflectors open and the glass door latched closed. Leave it there for 25-30 minutes. After finishing the start-up procedure, it's time to cook something yummy! I decided to start with an enchilada casserole that we love. I figured I couldn't mess it up because it's easy. In this photo, the casserole is just about finished cooking. What you see on the glass is condensation. When the sun is not at peak time of day, the cooking time needs to be lengthened to make sure the food is fully cooked. But the good thing is, the food will not burn — at least that's what they say. Some people will set their dinner in the Sun Oven, turn it so that it faces peak sun time. As the earth turns, the oven begins to warm up, cooks fully between 10 a.m. and 2 p.m, then begins to cool down. By the time you get home from work, dinner will be done and the perfect temperature - not too hot and not too cold. Perfect! Here's the end result — and it turned out perfectly! I used one of the dark enameled pans that came with the oven which was big enough to provide eight servings. This was an easy recipe containing hamburger which I cooked on the stove before assembling the ingredients. I could have used freeze dried meat — any kind — roast beef, crumbled beef, or chicken. I layered 4 large tortillas, a can of black beans, 2 cups of homemade salsa, 1 tablespoon of enchilada seasoning (mixed together), with shredded cheese. All ingredients and flavors melded and melted together deliciously! Watch this video for a great demonstration of using the Sun Oven. Should you buy a Solar Oven? A resounding — YES! 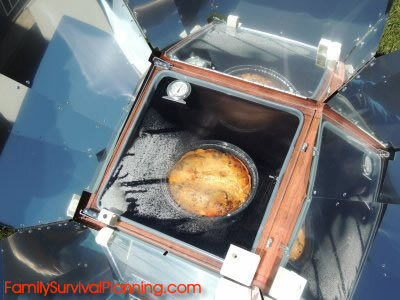 Solar ovens are so safe and easy to use that even kids can use them. They are great for boaters, campers and environmentally conscientious people all over the world. What a great way to teach children about solar energy and enjoy the tasty results. And what if the day comes when the "lights go out"? Freeze-Dried Food - Is it worth it?